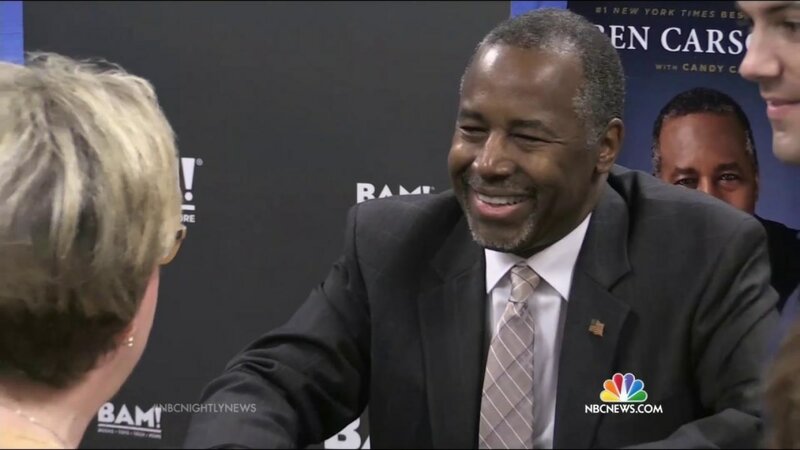 Ben Carson has surged into the lead of the Republican presidential race, getting support from 29 percent of GOP primary voters, according to a brand-new NBC News/Wall Street Journal poll. 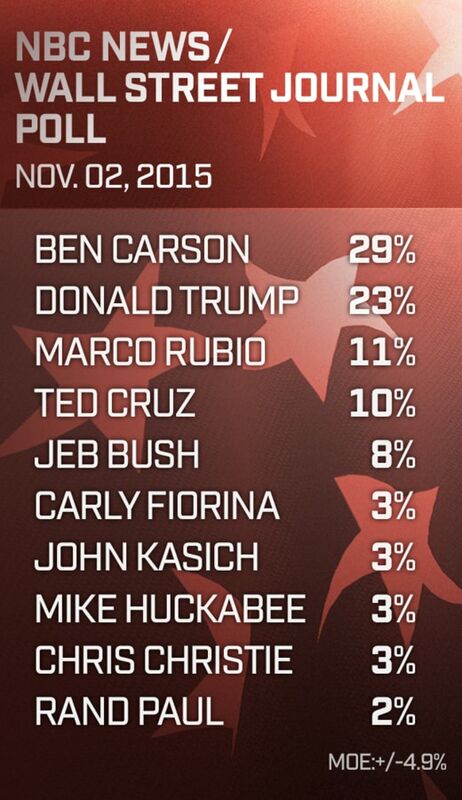 That's the highest percentage any GOP candidate has obtained so far in the survey. 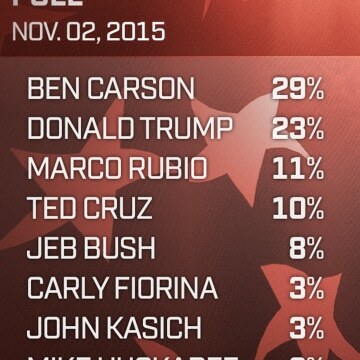 Carson's 29 percent is followed by Donald Trump at 23 percent, Marco Rubio at 11 percent, Ted Cruz at 10 percent and Jeb Bush at 8 percent. 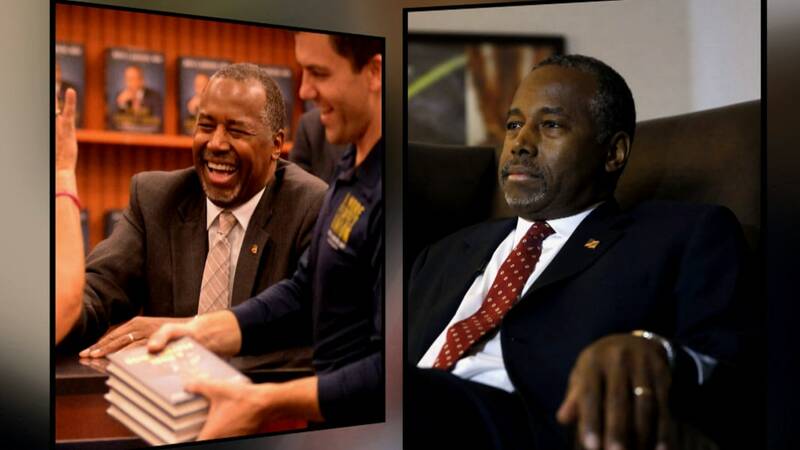 These findings are similar to a New York Times/CBS poll released last week, which also showed Carson in first place in the national GOP contest. If past polling has been about Trump leading the GOP field, "then this survey is about Dr. Ben Carson, who is currently the man to beat for the Republicans," says Democratic pollster Fred Yang, whose firm Hart Research Associates conducted this survey with Republican pollster Bill McInturff. The NBC/WSJ poll was conducted Oct. 25-29, so before and after last week's third Republican presidential debate hosted by CNBC. Earlier in October — before that debate — Trump was ahead the GOP at 25 percent (then the high-water mark for any Republican candidate in the poll), Carson was at 22 percent, Rubio at 13 percent, Cruz at 9 percent and Bush at 8 percent. In addition to leading the GOP field, Carson also becomes the first GOP candidate in the NBC/WSJ poll to get majority support as either a first or second choice among GOP primary voters. A combined 50 percent of Republican voters pick Carson as either their first or second choice in the GOP presidential race — followed by 35 percent for Trump, 24 percent for Rubio and 23 percent for Cruz. Carson "has broad support, but we don't know yet the depth and commitment of that support," Yang says. "It doesn't mean it is enduring," but it's still noteworthy that a majority of Republicans pick Carson as either their first or second choice, adds GOP pollster McInturff. And while there's still plenty of time for an establishment GOP candidate to beat Carson or Trump, Democratic pollster Peter Hart wonders if the 2016 Republican race is shaping up to resemble 1964, when Barry Goldwater won the GOP nomination. "What if the cake is baked?" Hart asks. "This is not a status-quo electorate." This NBC/WSJ poll was conducted (by telephone and cell phone) Oct 25-29 of 400 GOP primary voters, and it has a margin of error of plus-minus 4.9 percentage points.